The phrase “Sound Massage” is used loosely these days to depict one form or another of Sound & Vibrational Therapy, and in some situations physical massage is also integrated into the experience. Barb’s unique and inventive form of Sound Massage integrates Hawaiian Lomi Lomi bodywork massage with Sound & Vibrational Therapy and a Sound Journey experience. The sounds and vibrations actually massage you from the inside out, while the physical bodywork massages you from the outside in. The Hawaiian Bodywork focuses on relaxing the muscles, as well as treating the body as a whole, addressing the subtle body levels as well as the physical body level. The sounds and tones naturally guide you on your own unique journey, into a timeless zone, on a personal “mini vacation”. The result is a deeply relaxing experience that brings you to a place of peace and harmony, and a sense of centeredness and balance. The beautiful, sustaining multi tones emerging from each bowl are magically mesmerizing, lulling you down into a Theta State, where deep healing can happen. Emotions are soothed, while the mind starts letting go and surrendering to the beauty and peace of the moment. The “mind chatter” simply falls away as harmony frequencies guide you deep down in to the peace and harmony inside of your own self. All levels of your being--physical, mental, emotional, and spiritual--are profoundly affected at once, helping to bring all aspects of your being back into harmony. From the moment you lay down on the comfortable waterbed massage table, you find yourself firmly, yet softly supported, as though floating on air. 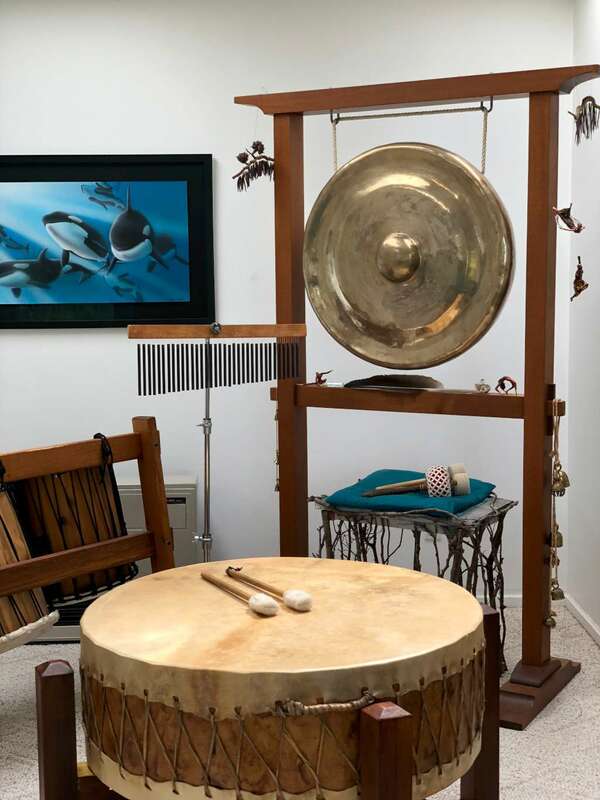 Speakers in the table enable the magnificent vibrations and tones of a Balinese Gong to penetrate and relax the muscles. Other healing instruments from around the world are used to enhance the Sound Journey experience, such as ocarinas, chimes, tingshaws, or pow wow drum for grounding. “I felt like I was in the womb, surrounded by vibration.”---K.D. “WOW! That was FABULOUS! My body feels vibrant and alive, my mind relaxed and clear. I felt as if I was experiencing myself on a molecular level. The experience feels multi-dimensional.”---J.G. “I always feel so good after this......much better than when I walked in. This is the only massage where I feel like this afterward....very relaxed, yet alert and awake and feeling joyful.”---C.M. “An extraordinary sensory experience. Those vibrations went all through my body. I’ve never experienced anything like it.”---S.S.
AMAZING! I’ve had a lot of massage, but nothing like THIS!”--M.O.